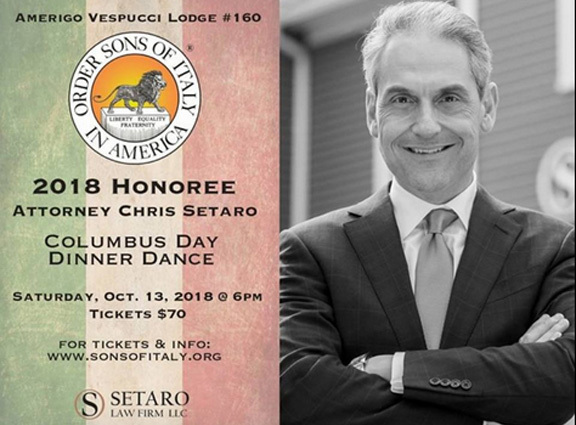 You are invited to the Columbus Day Dinner Dance to be held on Saturday, October 13, 2018, at 6:00pm, Anthony’ Lake Club, Danbury’s only lakefront event center, Amerigo Vespucci Lodge, 10 Christopher Columbus Avenue in Danbury, CT. The 2018 Honoree receiving the the 2018 Community Service Award is Attorney Chris Setaro, of the Setaro Law Firm. Open Bar / Cocktail hour starts at 6:00pm, with Rocco’s specialty assortment of hot and cold appetizers. Dinner is at 7:00pm with a gourmet salad tower, Rigatoni with meat sauce, surf and turf – lobster tail and filet mignon, sauteed fresh green beans, coffee and dessert. Music provided by Le Stivale. Tickets are $70 per person, may be purchased online at: www.sonsofItaly.org or call Rose (203) 885-3522 or Lisa (203) 313-9807. Also be sure to attend the Italian flag raising event at Danbury City Hall at 9:00am on Saturday, October 13, 2018, hosted by the Amerigo Vespucci Lodge #160. Mayor Mark Boughton will be there along with Amerigo Vespucci Lodge President Bruno Tropeano, Vice President Tony Scalzo, and officers Madame Ceremonies Rose Musolino, Lodge Treasurer Lisa Scalzo, and other officials. Our lodge was established July 29, 1924 – the 160th lodge to be established under the Order of the Sons of Italy. The members of the Amerigo Vespucci lodge are mostly of Italian culture and take our heritage seriously. Throughout the year we celebrate our heritage and support Italy through activities like the FIFA World Cup Games, or to honor Amerigo Vespucci on Memorial Day. The City of Danbury erected a monument of Amerigo Vespucci to honor Italian-Americans in the Danbury area. We encourage the public to come and enjoy our lodge and encourage people of Italian descent to apply for membership. We are a Non-Profit Organization and elect board members each year who volunteer and dedicate their time to managing all aspects of the Lodge. Our current President, Bruno Tropeano, stands out as a leader who aims to better the club and affect our communities near and abroad in positive ways. He recently held a fundraiserto help the people in Italy affected by the earthquake. Click on Media HERE to watch a video about the earthquake and the Lodge’s efforts. 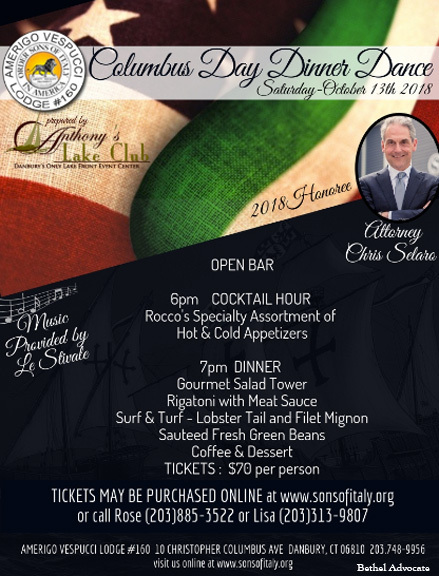 Established July 29, 1924, we are proud to be part of the Order of Sons of Italy in America (OSIA) which was started in Little Italy, New York in June of 1905. OSIA was the idea of Dr. Vincenzo Sellaro and five other immigrants from Italy who came to the United States during the Italian migration of the 1890’s and early 1900’s. OSIA has been involved in promoting immigration legislation, assisting in the assimilation process, supporting cooperation of trade and diplomatic relations between the US and Italy, initiating social and fraternal events, encouraging educational achievement through scholarships, serving local communities through a variety of cultural events and fundraising for local charities, and providing low-cost group financial investments and insurance programs for the benefit of members nationwide. Today, OSIA is the oldest, largest, and most demographically diverse association of American men and women of Italian descent. Since the organization’s beginning, men and women share equal status, as do individuals of all ages and professions. We encourage the study of the Italian language and culture in American schools and universities, the preservation of Italian-American traditions, culture, history, and heritage, and the promotion of closer cultural relations between the United States and Italy.